Hibernian managing director Fyfe Hyland has told BBC Scotland that leaders of a planned protest outside Easter Road on Sunday have been invited for talks. 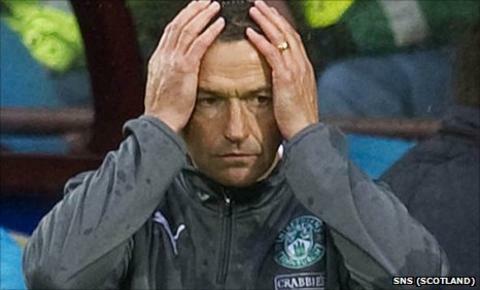 The club are bottom of the Scottish Premier League and some fans are unhappy with manager Colin Calderwood. "We are here to listen and engage constructively with supporters," said Hyland. "We understand why they are frustrated and angry. We share that frustration. We are supporters too." It has been suggested that fans could gather outside the Easter Road main stand to voice their discontent before the SPL match with Aberdeen. Calderwood has a record of 22 losses in 38 games since taking the helm in Leith. While the 46-year-old acknowledges the disruptive force such a measure could have, he is backing the majority of fans to drown out any protests as the players seek to leapfrog the Dons. "It could have a negative effect if it bleeds into the stadium," said Calderwood. "But I expect it to be overridden by the vast majority of the support, because they come to support the team. "Our actions can lead the way - nobody ever boos a winning team, and I don't expect that to happen. "We'll have the majority of fans on our side and we're delighted to have a game at home and a chance to get ourselves off the bottom." Calderwood has gathered just three points from the opening five league fixtures. But he believes the club has a sufficient calibre of players to climb off foot of the table and relieve any pressure mounting on his position. "I'd feel more pressure if I didn't look at my group of players and think that we have an excellent squad," Calderwood said. "We have an outstanding chance of winning this match on Sunday and I think we have an outstanding chance of progressing forward. "The start to the season has not been good - we didn't want to be bottom of the league after five matches. "We're now all match-fit, we've got greater strength in depth in the forward department and if we learn from mistakes then we'll make great strides forward. "I'm excited and looking forward to the next five or so games."